Before I disturbed it, this adult bed bug was wedged into a crevice in the wood framing of a bed frame. Peoria, Maricopa Co., Arizona, USA. Sept 2012. Length is about 6 mm. 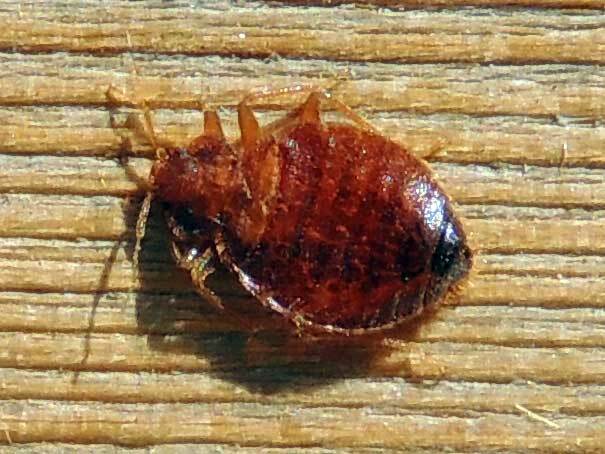 If it were not for humans and their habitations the Common Bed Bug would not be an inhabitant of the Sonoran Desert. Bed bugs have been following us since the days when our ancestors lived in caves. Indeed the closest relatives of bed bugs live in caves and feed on bat blood. Unlike most true bugs the adults are wingless. Now they have become a resurging pest of residences, hotels and rooming houses. Like other members of the true bug order they feed entirely on a liquid diet obtained through piercing-sucking mouthparts. This creates a challenge when we want to poison them with insecticides that work best when ingested. Bedbugs are also very adept at avoiding the spots where sprays have been applied ... with their hypersensitive chemical receptors. The bug at left was found in a house that had been vacant for months. It had remained hidden and mostly dormant until its sensitive receptors identified carbon dioxide in the air, the tell-tale presence of a warm-blooded animal breathing nearby! Copyright Michael J. Plagens, page created 19 October 2013.